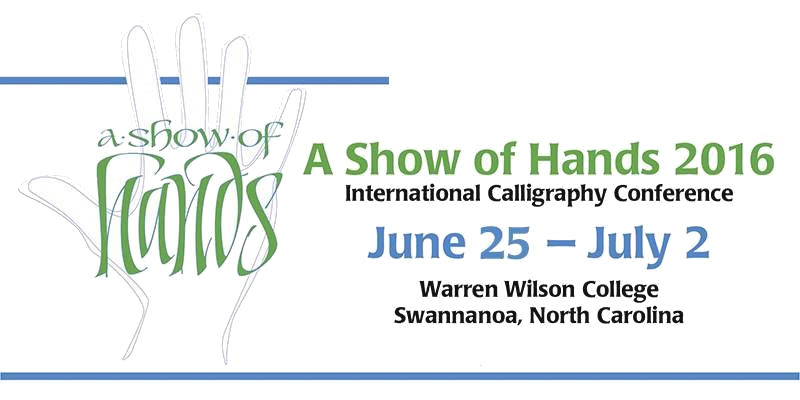 The 35th international calligraphy conference, A Show of Hands, alludes to the hands-on craftsmanship that makes the art of calligraphy so special. These conferences bring together an international collection of fine instructors and suppliers to the trade. Most importantly they are open to people from every skill level, from beginner to master, who have a passion for the lettering arts. If you are a beginner, you will be taking classes from some of the best teachers available, who will give you a wonderful foundation for learning this craft. And if you have more experience, there are many classes that will teach you new hands, new media, and focus on creating great design. Attending is a great way to renew old friendships and start new ones, while building and honing your calligraphy skills. This conference will be held in the heart of North Carolina’s beautiful Blue Ridge Mountains at Warren Wilson College in Swannanoa, NC. This walkable campus has great classrooms and a cafeteria focused on nutritious, healthy foods. Our temperatures in June are typically a bit cooler than lower altitudes, and nearby Asheville, NC is a favored destination for many travelers. Get your class supplies, books & more from JNB! John Neal Books is taking preorders for the conference and John Neal, himself will be at the conference with a wide variety of books, DVDs, and calligraphy-inspired goodies. If you preorder your supplies from JNB you will get 10% off of your order and it will be brought to the conference, which will save you on shipping costs. In addition to the discounts we are also offering a back issue of either Bound & Lettered or Letter Arts Review for free with your completed preorder. To take advantage of these offers visit the A Show of Hands page on www.johnnealbooks.com and add the product 16SHOW to your cart along with your preorder.